Dogs use their tails as a tool for social communication. A happy dog will wag their tail and an angry dog will have an erect or fluffed up tail. The different movements and positions of a dog’s tail can tell you a lot about how the animal is feeling or what they are trying to communicate. When a dog’s tail is between its legs, it could indicate a variety of things. Fear or pain are just a couple reasons we tend to think of initially. It can be frustrating for you as a dog owner (and maybe even your canine! ), trying to figure out what’s going on. If it just happening for a day, that’s one thing. But if a dog continues to tuck their tail, after some time, it may be a sign that something else is wrong. Aside from fear or general anxiety, dogs do position their tails between their legs as a response to numerous health conditions. Some of these ailments will be apparent with visible injuries while others could be challenging to diagnose. Don’t worry, with a little knowledge and upfront guidance, you can rule out or even identify the possible causes. 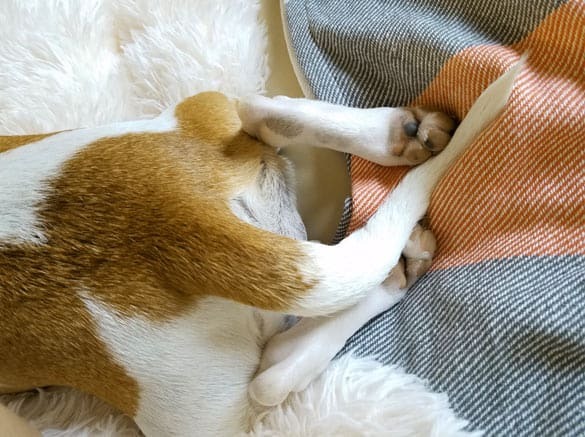 In this article, we cover these five somewhat common canine disorders that could cause a dog to tuck their tail between its legs. We have included a basic definition of the disorder, other signs and symptoms to look out for and the breeds that are more susceptible to each disease. We offer what you should do to help your dog and get their tail behavior back to normal. 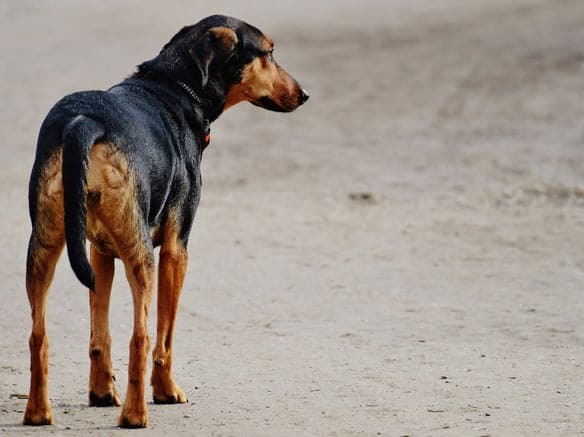 A tucked tail on a dog could be an indication of a skin infection. There are a variety of reasons that skin infections could occur on a dog’s tail. When a canine’s tail is scraped or cut, it is at more of a risk of getting an infection. Pyoderma is an infection that is caused by bacteria, fungus, or parasites. Rest assured, this condition is very common in dogs. The condition is one of the most frequent reasons that owners bring their dog into the vet. There has been a considerable amount of research done on Pyoderma in canines. There are several symptoms associated with Pyoderma. As one of the most common health conditions in canines, veterinarians are very effective at detecting this condition. The most frequently reported symptom of Pyoderma is the presence of papules or pustules. Papules and pustules are lesions that develop on the skin. They often appear similar to human “pimples.” The injuries are red on the outside and usually have a white, pus-filled center. There are several breeds of dogs that are more prone to developing Pyoderma. It is thought that these dogs are more at risk of developing the infection due to excess skin causing skin folds. WHAT CAN YOU DO AS A RESPONSIBLE DOG OWNER? The standard treatment for pyoderma and resolving the problem of your dog keeping its tail between its legs, is a prescription of antibiotics for a duration of two to six weeks. In some severe or chronic cases, the veterinarian will conduct a skin culture examination to determine whether or not the correct antibiotic is being used. The majority of pyoderma cases will heal with the use of antibiotics in combination with topical skin medicine. Dog owners should give their pets regular baths with special medical shampoo. Sometimes the meaning of a dog’s tail tucked between their legs can be challenging to identify. Canines use their tails for a variety of functions. Limber tail syndrome or acute caudal myopathy is a disorder within the muscles of the tail. Veterinary medical experts suggest that this condition comes from the overuse of the tail. Excessive or prolonged stress on the dog’s tail can cause damage to the vertebrae bones, muscles, and surrounding ligaments. Critical risk factors are overexertion, exposure to frigid water, and extremely cold weather. A dog with its tail between legs can mean it’s dealing with some kind of pain in the tail. In this case, it could indicate the dog is trying to cope or even communicate with its tail that something doesn’t feel right. As we’ve said, a painful tail is one of the symptoms of acute caudal myopathy. The symptoms generally occur within twenty-four hours of the event or situation that causes the condition. 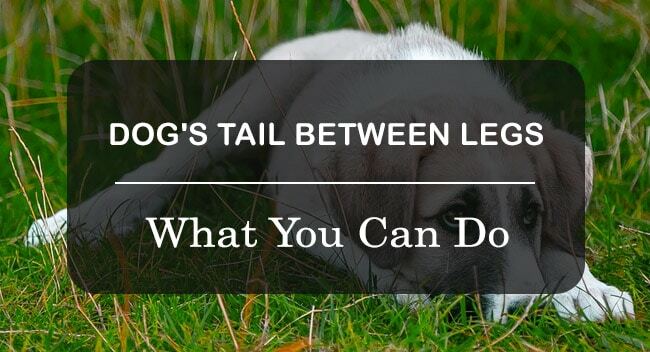 Certain kinds of dogs, sporting dogs, and working dogs are more susceptible to limber tail. It is understandable that the syndrome would occur more often in sporting or working dogs because one of the primary risk factors is overexertion (and that includes the tail working). In simple, standard cases of limber tail, the syndrome is effectively treated with anti-inflammatory medication and rest. The tail is likely swollen, and in pain, so owners shouldn’t allow the dog to do any strenuous activity. The majority of dogs with this syndrome will typically return to their usual, hard-working selves within approximately one week. A dog with limber tail syndrome is not more likely to develop the condition a second time. Therefore, once the tail is fully healed, owners should let their dogs go back to the things they love but keep a closer eye on their tails. A dog’s tail between his legs could signal that the dog is in pain. A fractured or dislocated tail can be an agonizing sensation for your furry friend. Believe it or not, dog tails are fractured easily. And those with longer tails are more at risk of a severe injury. You may be asking, how can a dog fracture its tail? As we just saw, it’s entirely possible that a dog’s tail between his legs indicates that the dog is suffering from a tail fracture. But what else should you look for? 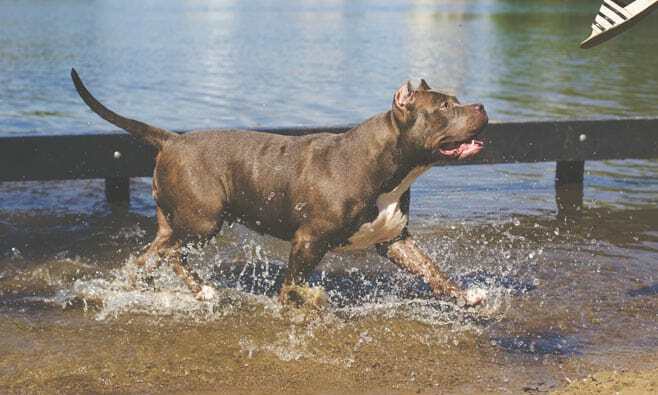 There are no dog breeds that are more susceptible to tail fractures than others. Often times a tail fracture will occur as the result of a “freak accident” or an event that is entirely out of the ordinary. Dogs with certain jobs, especially active dogs like Australian Cattle Dogs or Staffies for example, and those with longer tails may be more prone to tail fractures than other kinds of dogs. Also consider hunting and working dogs that are highly-active. They may be more at risk of a tail fracture because of the strenuous work they do daily. The recovery of your furry friend will depend on numerous factors. The most important factors are the cause of the injury, the severity of the injury, any additional trauma, and whether or not the effects of the injury will be permanent or temporary. Owners should be ready to provide close observation and ensure the dog is resting without moving strenuously. You also should prepare a nutritious diet and a safe, clean environment. Depending on the severity of the injury, your dog should be back to normal and doing their usual tricks within a few weeks to a few months at the most. Just watch that tail! There is one aspect of the summer months that dog owners despise, the dreaded increase in fleas. In most areas that are not warm year-round, fleas are only around in the summer. These tiny insects can make life miserable for you and your dog. Their tail between their legs is one way of they’re let you know. Fleas are little, brown insects that enjoy warm temperatures. Fleas are attracted to dogs for the same reason that they are drawn to humans, the blood! Fleas also possess powerful back legs, which allow them to jump from one animal to another almost instantly. A dog’s reaction to fleas can depend on several factors. Some canines will have a severe reaction, which makes them highly uncomfortable and irritated. Other dogs may not show much or any irritation. There are no specific breeds of dogs that are more prone to fleas than others. Fleas don’t only target dogs, they will go after almost any mammal, if the environmental conditions are suitable. However, there are specific causes and risk factors for dogs contracting fleas. Squirrels, rodents, and cats can carry fleas and drop them on the ground. The fleas can then hop off the ground and onto your dog. Fleas will also drop flea eggs in a home, which can then lead to an infestation of the entire house. For the effective elimination of fleas, dog owners should carefully follow the advice of their vet. Many owners will approach a flea infestation nonchalantly, which will allow the outbreak to grow and makes elimination far more challenging. Treatment of the canine carrying the fleas will be the primary concern. Your veterinarian will likely prescribe a specially made flea shampoo, which should be used regularly to wash your dog. Flea shampoo is one of the most effective methods of quickly getting rid of these pesky insects. Furthermore, insect growth regulators (IGR) provide consistent protection against fleas. IGRs don’t need to be applied as often as flea shampoos and other anti-flea medications. IGRs work by inhibiting fleas from reproducing and continuing their infestation. Other treatments involve treating your pet with medicines that will sterilize all existing fleas. This one takes some time but can be more effective in the long run. You can make a big difference in how often flea infestations occur and the severity. In most cases of dog’s injuries, the owner can’t do much other than follow the instructions of the veterinarian. With fleas, dog owners can regularly apply preventative measures. Most people would consider that when a dog is wagging its tail, the dog is happy. Seems completely logical, right? This is one of the reasons that happy tail syndrome can be so problematic, owners have trouble recognizing when it’s actually a problem. Happy tail syndrome can cause significant injuries to your dog’s tail. All dogs wag their tails, but some dogs are so big and powerful that over wagging can cause injury. Large dogs with extended tails are more at risk of happy tail syndrome. The injuries from this syndrome will usually appear at the top of the tail because the skin isn’t as thick in that region. Due to the region of the damage, and the dogs urge to continue to wagging their tail, the condition can be challenging to treat and heal. An injured tip of the tail and a dog’s tail between his legs can imply that your furry friend may be suffering from the not-so-happy, happy tail syndrome. Most tail injuries and syndromes will create superficial wounds that aren’t apparent to the naked eye. More profound internal tail injuries will make their presence clear through limiting or dramatically changing the movement of the tail. The breeds that are more susceptible to happy tail syndrome are dogs with short hair, long tails, and forceful rear ends that can wag their tails powerfully. These dogs are most commonly associated with happy tail syndrome because they all have long tails and powerful behinds that can flip and toss their tails so much that it can cause severe damage. That said, any dog with short hair and strength that can wag its tail powerfully is at risk of the syndrome. Happy tail syndrome can turn from a minor issue a severe problem if the tip of the tail isn’t allowed to heal. In this case, a dog’s tail resting between the legs is actually a good thing. What you want to look out for is infection as it is a critical concern. Thankfully, you can make a big difference in the healing of their furry friend’s tail. When you notice that your dog has an injury to its tail, it’s critical to keep it clean and covered. Cleaning – Be sure that the wounded area of the tail is clean before proceeding to step two. Ointment or medication application – Your veterinarian will prescribe some type of antibiotic ointment or medication. Spread some of the cream on and around the wound to help lower the risk of infection. Apply bandages – After you have put on the ointment, apply a piece of gauze or wrapping on the injury. Be sure that the dressing is large enough to cover the entire wounded area. Change the bandages – For the most efficient healing, you must change the wrapping of the injury daily until it is fully healed. Canine tail movement is a social tool that they use primarily for communication. 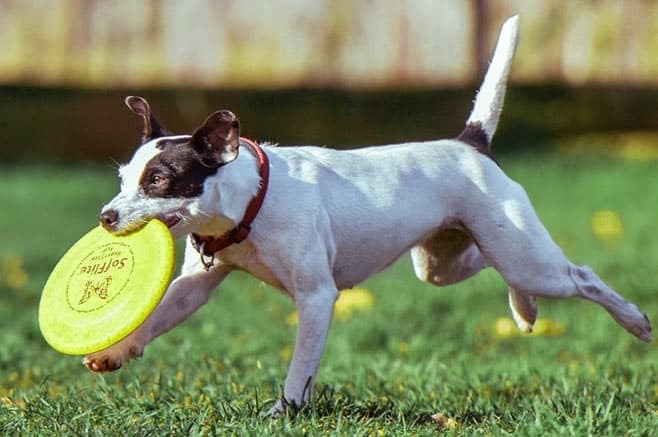 Dogs that don’t wag their tails, or if there is a noticeable change to the movement of the tail, you can expect that there is definitely a problem you should ignore. Dr. Karen Becker is a leading wellness veterinarian. She has studied, treated, and discussed numerous health conditions in canines. Be sure to check out this video where she explains canine tail injuries further. The majority of canine tail conditions are mostly superficial and will quickly heal with proper treatment and management. When these minor conditions are left untreated, they can lead to infections and more severe complications. You should schedule a visit with their veterinarian when you see the first sign of something different about your dog’s tail. This is never more true if your dog’s tail is between legs and not curled up next to you or wagging about with calm and submissive energy.